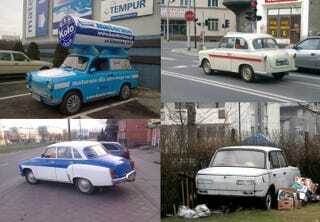 Today we continue our series of interesting and/or obscure cars that are living and dying in Poland. Several weeks ago we started a theme Cars of Axis Powers and thus far we have covered West German cars, Japanese cars, and Italian cars. Today we conclude this theme with a look at the cars made in the Deutsche Demokratische Republik, also known as East Germany following the post-WW2 break up of Germany. Unlike its Axis Powers brothers, East Germany fell under Soviet communist control, and pretty much everything sucked there compared to the life in the west. There maybe no better contrast than cars to compare life under Soviet occupation to that of NATO countries. Where West Germany experienced the “economic miracle” and became world’s third largest economy by the 1950′s, the few lucky East Germans that were able to get a car were limited to a plastic box propelled by a loud and smokey 2-stroke engine. Today, as we will see, there are still East German cars in Poland and some are even still running. Those that are still running are owned as either promotional vehicles, by enthusiasts, or by those completely oblivious to the fact that there world around them has completely changed. As always, all images are courtesy of zlomnik.pl and its awesome readers. Some of the pictures may have been taken outside of Poland. Enjoy.